Here’s an interesting tidbit from our institutional history. Back in 1950 when the Fenimore Art Museum acquired the folk art collection of Jean and Howard Lipman, included in the many masterpieces that came our way was a phenomenal stone tavern sign. 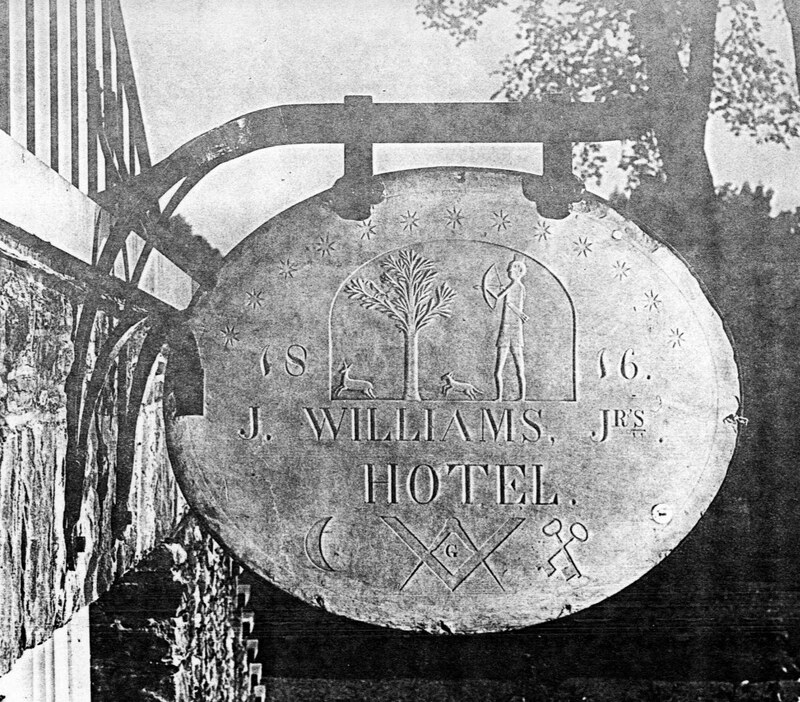 The piece, about 38 inches wide, was carved in 1816 out of unpolished marble to advertize the hotel of John Williams Jr. in Ashland, Massachusetts. It is two-sided, and features a vignette of an Indian hunting deer on one side and a stylized eagle (adapted from the Great Seal of the United States) on the other. 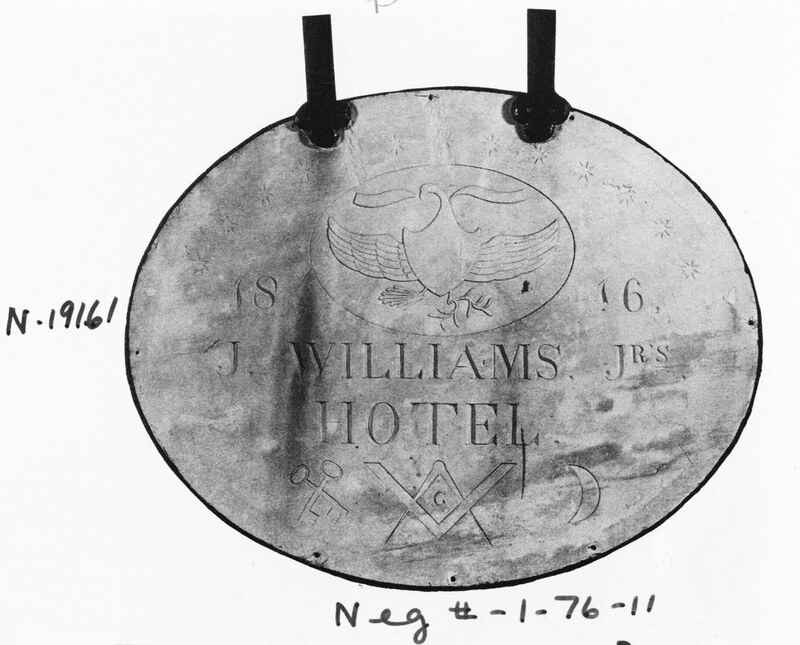 Masonic symbols along the bottom of both sides indicate the hotel’s use as a temple for the local lodge. 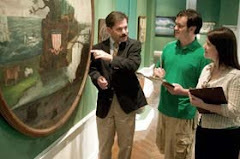 The eagle is of particular interest; it is really one of the most elegantly rendered symbols of the young American Republic to be found anywhere. Our then-Director Louis C. Jones liked it so much that he made it the logo for our parent organization, the New York State Historical Association, sometime in the 1950s. When I first came here in the 1980s it was still in use as a logo on all of our stationery. But one day I noticed something odd. On the sign itself, the head of the eagle face the bundle of arrows in the eagle’s claw. On the stationery, it faced the olive branch in the other claw. By the mid-1980s this had been corrected, as you can see in the images here. Everyone seemed to chalk it up to a printer’s error, a misinterpretation of the original sign. 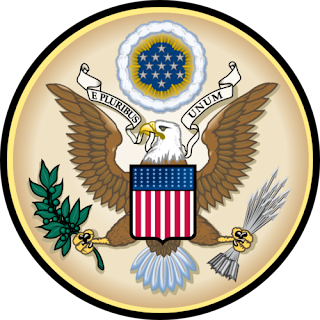 What is particularly interesting is that the original Great Seal (adopted in 1782) features the eagle facing the olive branch, but still clutching the arrows in the other claw, indicating a peaceful country that was fully prepared to defend its new-found liberty. The carver of the Williams hotel sign, working in the era immediately following the War of 1812, chose to (or was asked to) emphasize the warrior side of the eagle’s dual personality by having it face the arrows. One day I mentioned this to Lou Jones, who was quite old by that time but still sharp as a tack mentally and every bit the Merry Prankster he had always been. He told me, chuckling, ‘Oh yes, the hotel sign. Back in the 60s we turned the head to face the olive branch as a silent protest against the Vietnam War. We never told the trustees.” Lou’s protest had an extended life, lasting at least a decade longer than the war it quietly spoke out against. The last several posts concerning advertising from the past have been wonderful. It makes one wish that today's merchants had some of this artful quality in their choice of signage. This marble sign is great. Very powerful. Thanks, Gary. I agree with you, of course. Things started going downhill when we all learned to read, and also when mechanical processes supplanted hand craftsmanship in the late 19th century. You've given me an idea for a post on retro-craftsmanship in contemporary signs. I'll be on the lookout for examples! Thanks again!